Magnetics - Hager-Richter Geoscience, Inc. : Hager-Richter Geoscience, Inc. Magnetic surveying is ideal for both reconnaissance and focused surveys. It is expedient and cost effective, covers more ground in less time, and requires a minimum of field support. The portability of the instruments makes magnetic surveying well suited to sites with topographic variations. Magnetic surveys measure the earth’s magnetic field very accurately. Buried ferrous materials, and in some cases, changes in bedrock lithology, produce disturbances in the local magnetic field that can be readily detected by magnetic surveys. Station measurements are made and digitally recorded in the field. While the survey data are collected, a nearby base station automatically records data to track the diurnal variation in the earth’s magnetic field. 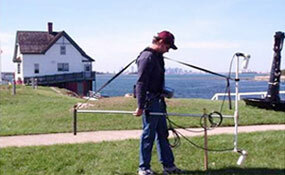 As with any survey technique, magnetic surveys have certain limitations. Overhead and underground utilities, fences, and buildings may interfere with the collection of accurate data. Our experience allows us to advise you on the suitability of the magnetic survey technique for specific projects. The accuracy and thoroughness of our magnetic surveys are enhanced by our state-of-the-art field equipment. We use microprocessor-controlled cesium vapor magnetometers that measure both total magnetic field strength and the vertical magnetic gradient. The gradient data help us discriminate near surface objects from objects that are more deeply buried. We use one magnetometer as a dedicated base station to ensure the accuracy of the field data collected with the survey magnetometer. We use the base station data to correct for diurnal variation of the earth’s magnetic field and to detect magnetic storms. Little Brewster Island, Boston Harbor, MA: Cesium Vapor Magnetometer survey for possible artifacts at Boston Light. A Superfund site in southern New Hampshire was suspected to contain buried drums containing hazardous wastes. We first conducted a magnetic survey to determine the location of buried ferrous metal. 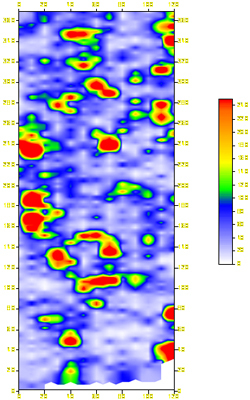 Our client used the magnetic anomaly maps that we produced to guide the excavation of the objects, and found over 200 steel drums stacked in trenches. Following the excavation, we conducted another magnetic survey to document that all of the drums had been found and removed.